Please use these links to get the links below to get the latest content and update any links or bookmarks you might have. R.W. 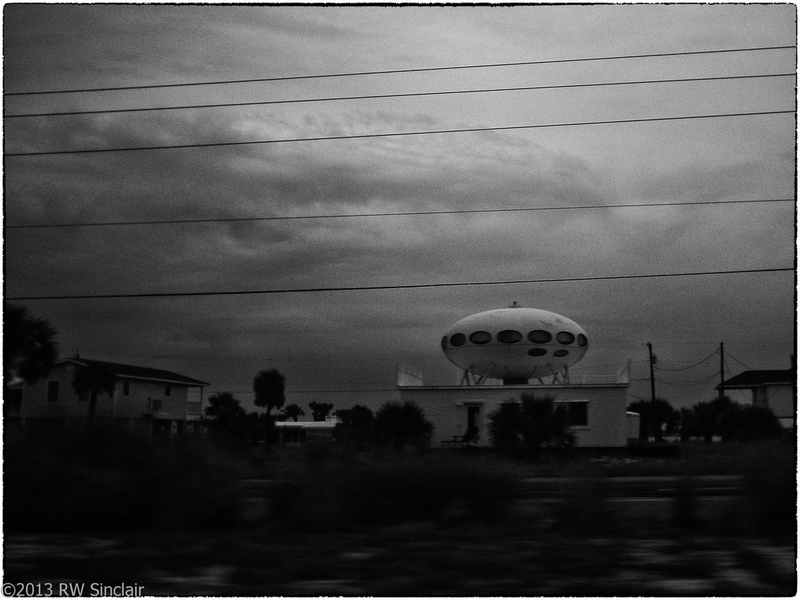 Sinclair snapped the photo below on what looks like a dark and stormy in Florida confirming this Futuro remains on site as of 070513. The photo was posted to Flickr under CC 2.0. The three videos below were uploaded to YouTube by TheGickel on 052608, pensacolabeachinfo on 072606 and Nick Fox on 050212 respectively. The photo below is by C-Monster and displayed under CC 2.0. The photo was taken 090508 and is one of the best shots I have seen showing the ramp up to the Futuro. 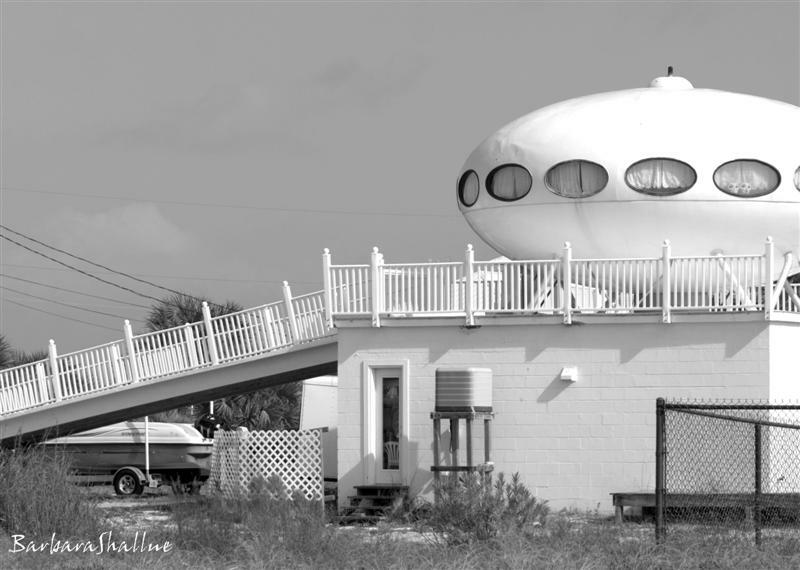 The Gulf Breeze Futuro seems to have been photographed more than many of the other Futuros so there are a great many photos to choose from when thinking about portraying this Futuro. In my opinion the shots below by Barbara Shallue that were posted on 012312 to her blog Confessions Of A Photography Addict are definitely among the best. I am not by any means a photographer, I take snaps like many of us do, but I am no expert for sure; I don't know if these shots were taken in unusual light, if some kind of filters were used or what but there is something about the lighting and the tone of the shots that makes them stand out from the crowd. A photo by Convict J-man taken 091811. I have always liked black and white photography and this is a great example. A photo by ChiDN. Great black and white shot taken 102209; looks like the wind is up and serious weather is on the way. A photo by Gregory Moine shot 122909 [CC 2.0]. This shot is taken at night and features some cool lighting on the Futuro. A photo by flabonganator. This nice close up was taken 041012. A photo by usc_ty taken on 082512. This nice shot provides the latest confirmed date for this Futuro. For something just a little different check out the three photos below. 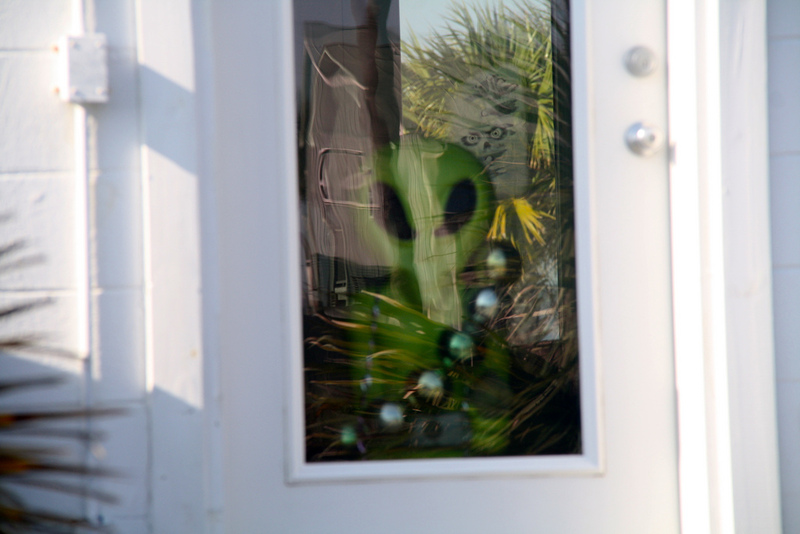 The first is by Innisfree Hotels [CC 2.0]; a really well composed shot featuring an "alien" and some cool reflections. The second, by Gigi Elmes features - well I am not entirely sure what it features; you will have to decide for yourself! The third of the trio is by Stephen Ulman who recently graduated Washington State University with a master's in landscape architecture. 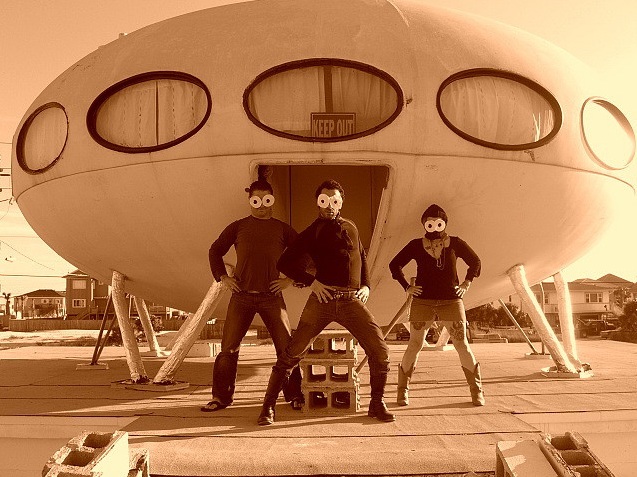 The photo is of a 2009 drawing Stephen [along with Ryan Anderson according to the drawing's tag line] did of the Futuro. On his blog Stephen says "I drew this from a photo and added my own improvements to the property." Looks pretty good to me; if I ever manage to buy my own Futuro you might just have a job Stephen! 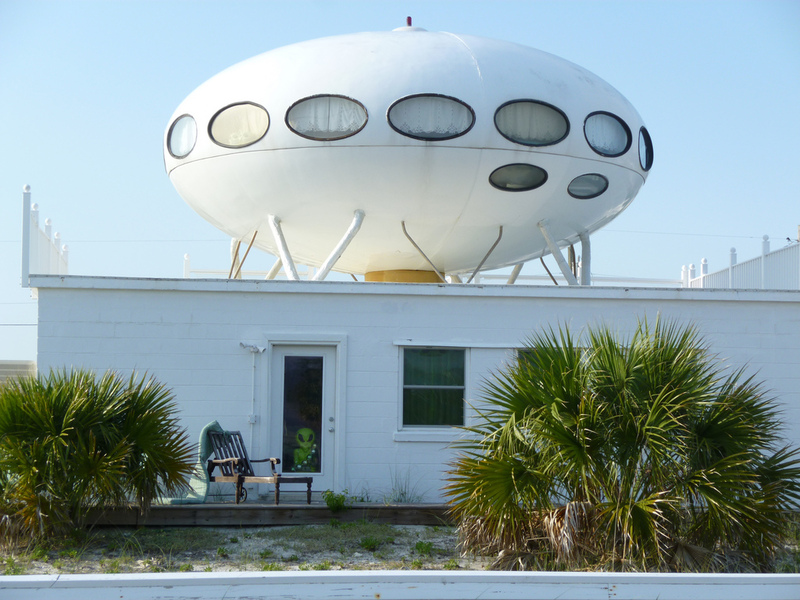 There are many more photos of this Futuro out there; you can find some of them on Flickr under the tag "futuro house pensacola". In the Winter 2007 issue of CA Modern Magazine there is an article about Wayne Donaldson's Idyllwild Futuro. 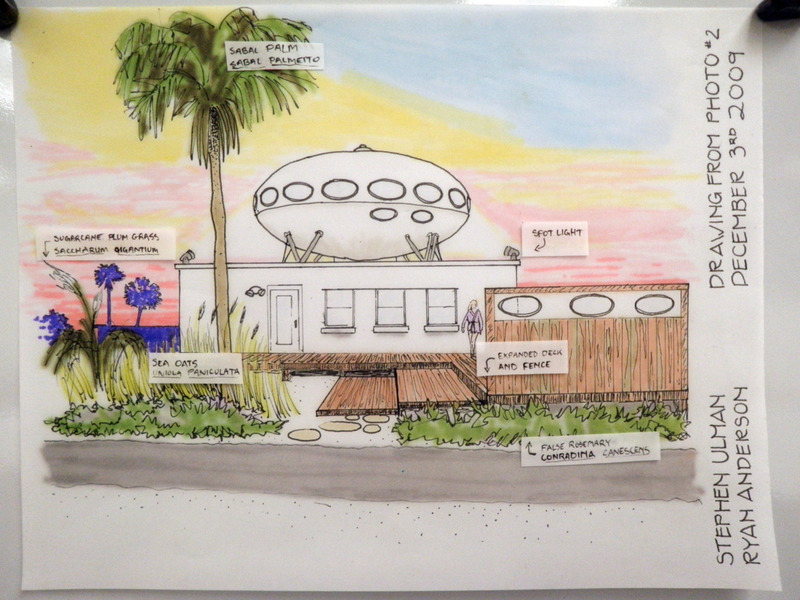 Also in ths article we hear from Victoria Clarkin, owner of the Gulf Breeze Futuro. Clarkin says that after spending her high school graduation weekend at the Futuro she "... knew the spaceship was going to own me one day". 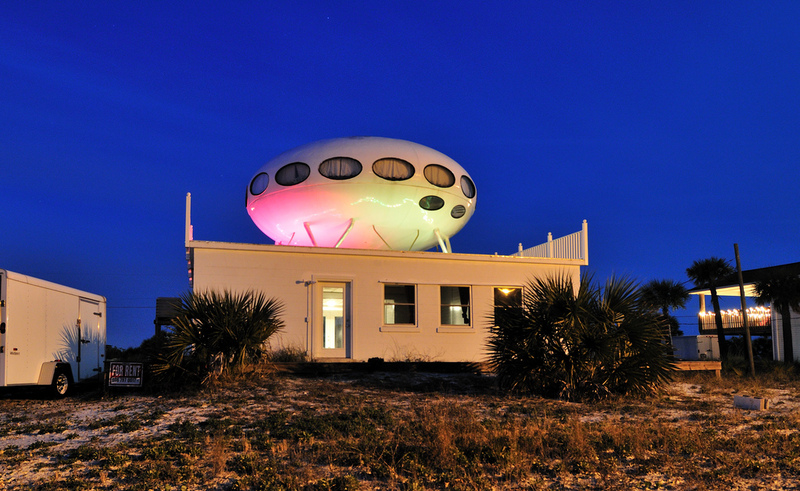 Victoria and husband Mark use the Futuro as a beach house and it also serves as headquarters for the Pensacola Beach Preservation & Historical Society. 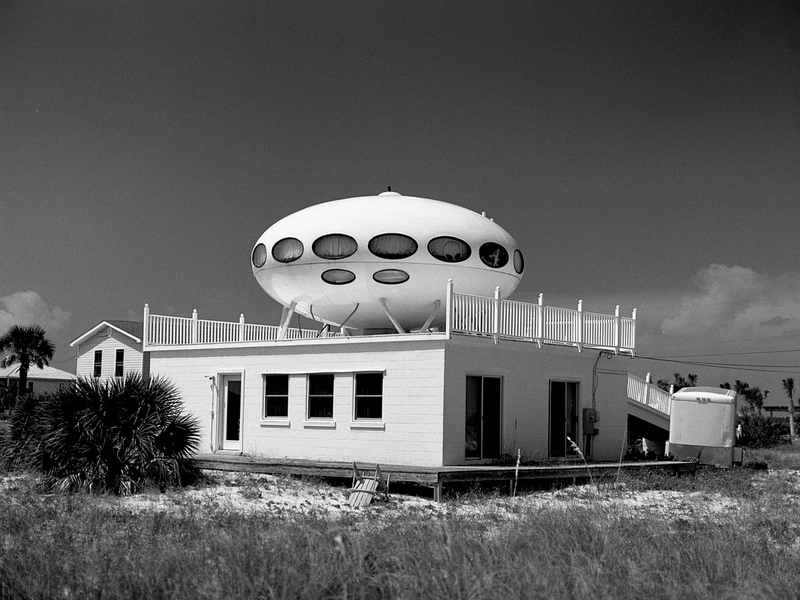 Perched atop a 1950's era concrete beach house the Futuro has withstood hurricanes Ivan and Dennis; Victoria says "It's round and aerodynamic so when rain and wind hit it it doesn't get too damaged." 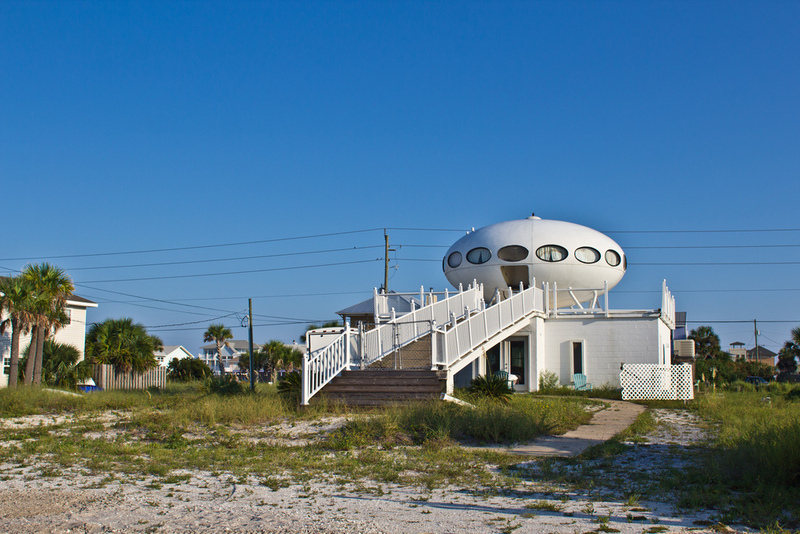 The house also withstands hordes of tourists on a daily basis; Clarkin tells us that on a busy beach day 500 or more people take photos of the Futuro. We can place the Futuro on site using Google Earth's historical satellite imagery as far back as 012394; the current imagery is dated 010312. 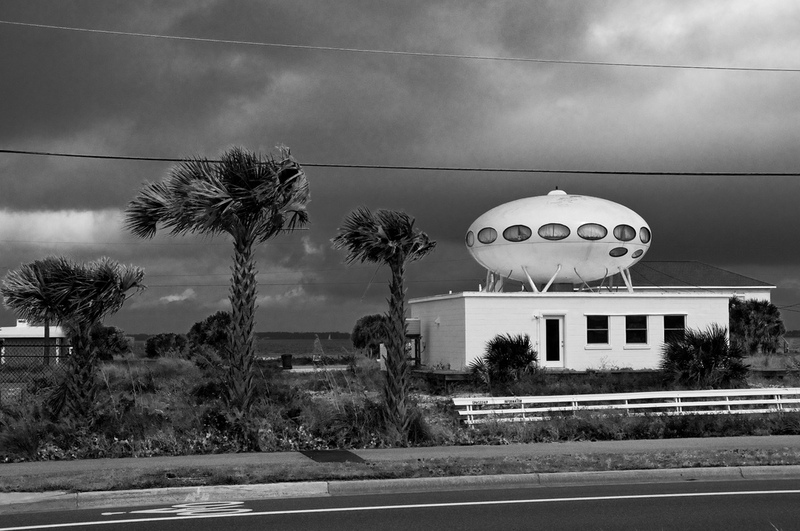 However all of the evidence suggests that this Futuro has only ever been located here. An article on the website Toes In The Sand informs us that "A helicopter helped it land on it's current launch pad in the early seventies". That same article also references hurricane Ivan telling us that "It even held its ground through Hurricane Ivan which completely immersed it's 'launch pad' in water". 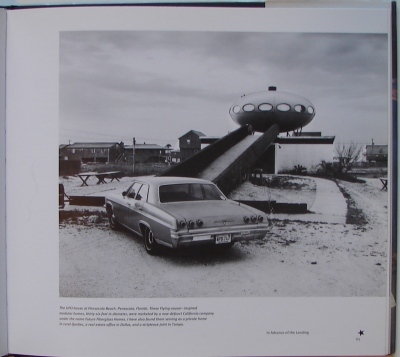 I am assuming that the "launch pad" is the building upon which the Futuro is situated. 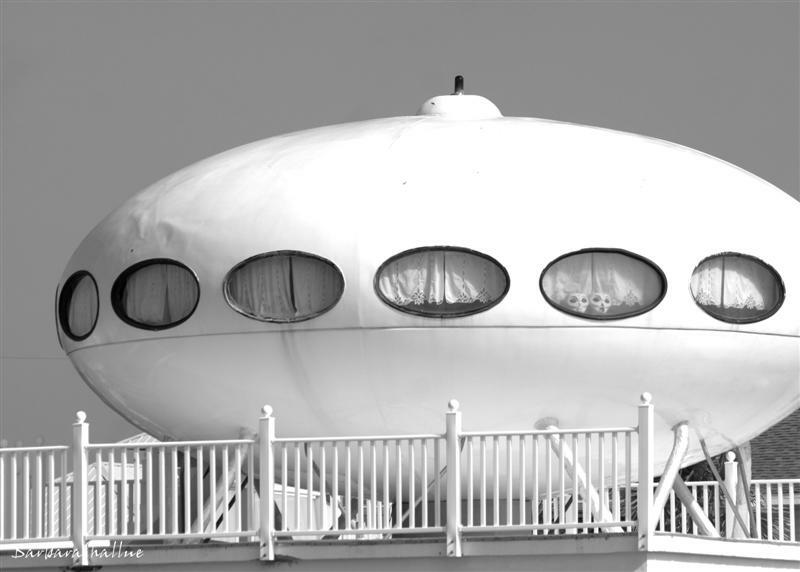 Another possible indication of age is a really cool old black and white photo of the Futuro. Though I have not been able to find the date this photo was taken the composition and tone along with the car parked out front all suggest a photgraph of some age. 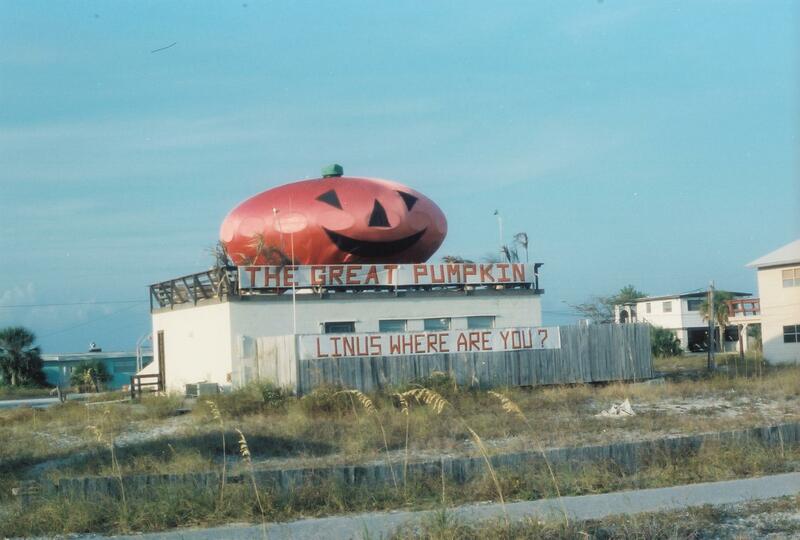 The copyright on the photo is held by the Pensacola Beach Preservation and Historical Society and you can check it out here. This photo also appeared in the Toes In The Sand article referenced above and it is seen on page 95 of Douglas Curran's book In Advance of the Landing. 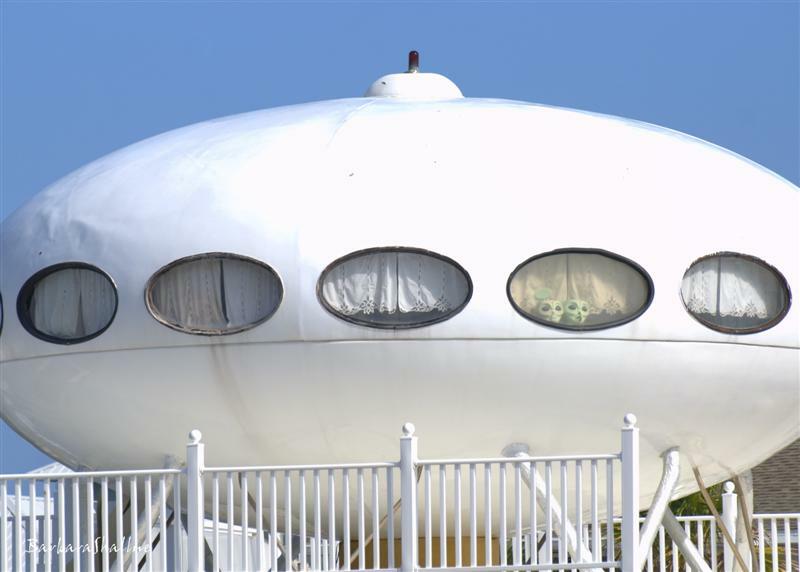 In the book the notes that accompany the photo suggest that the Futuro was 36 feet in diameter; this is not the case and a quick check on Google maps will confirm that this unit is the same size as other Futuros. A photo of my copy of the book is below. This is a deliberately low quality photo of page 95 from my copy of Douglas Curran's book "In Advance of the Landing: Folk Concepts of Outer Space ". My intention is to illustrate the both the old photograph of the Futuro and the books contents and not to provide a copyright infringing image to be copied and reproduced elsewhere so please respect the author's rights and if you would like to use the book's content purchase your own copy. Thanks! 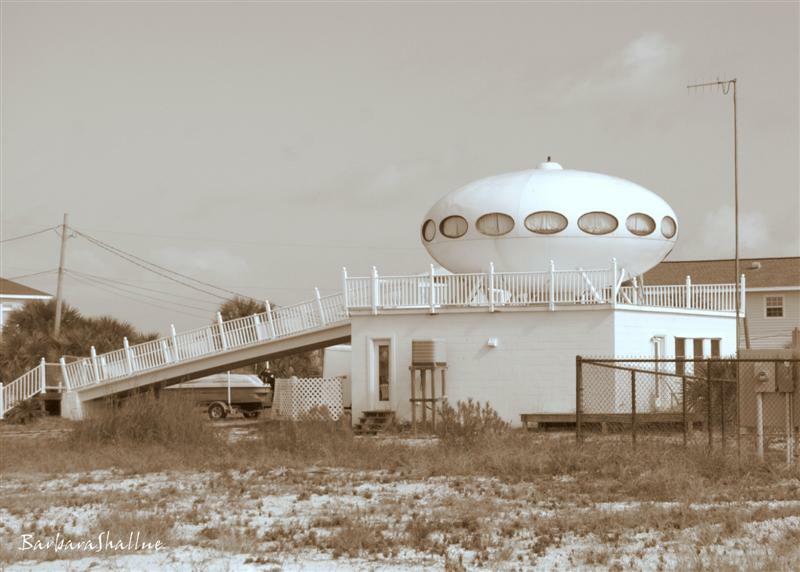 A further confirmation of the idea that this Futuro has spent its entire life at this one location can be found on RoadsideAmerica.com where, in an 082808 comment, Connie F. tells us that it "was first lowered onto the launch pad in the late sixties by a helicopter". 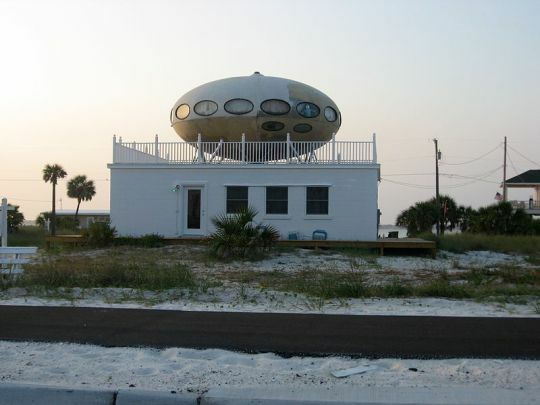 Also of interest on the same RoadsideAmerica.com page is the suggestion, in another comment, that the "structure is built like a UFO to lift up and float if the area is ever flooded out". To me clearly an incorrect statement; there is nothing I have ever seen that would suggest that as a design motive on the part of Matti Suuronen and based on the Futuros I have seen in person I am not too sure they would float that well anyway. The Futuro makes a brief appearance in the music video "Even Though I Want To"; a Choice Video Services, Inc. Music Video Production for Pearl Clarkin. Given that the Victoria Clarkin owns the Futuro I am guessing there is a family relationship. The Futuro appears briefly about a minute and ten seconds into the video. 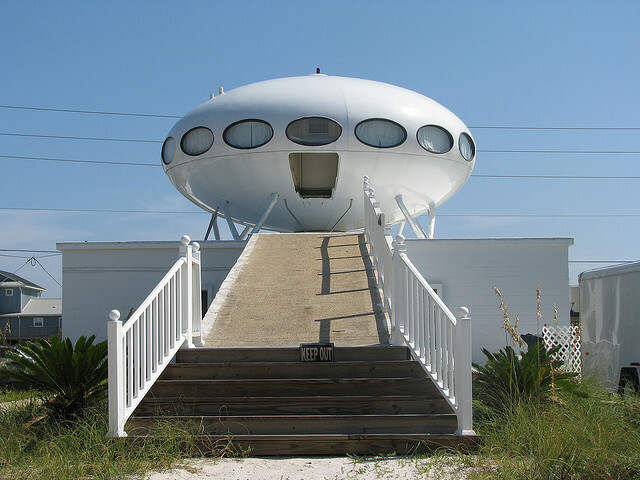 For more on the Futuro and to follow any changes in the future you can check out it's Facebook page "Spaceship House". I am always looking for additional information, history, details, images, videos; just about anything Futuro I guess - if you would like to contribute please use the Futuro Contact Form at the bottom of the main article or email me.